We’re rapidly approaching that most wonderful time of the year again, folks – that’s right, it’s the holiday season! Regardless of what you celebrate or how you celebrate it, it’s a great opportunity to spend time with loved ones, relax, and enjoy a pervasive sense of jolliness. It’s also the perfect time for martial arts! There are few bad times for martial arts, actually. If your kids are out of school for the holiday season, they probably have more energy that they (or you) know what to do with. They may still have martial arts lessons (or not – instructors need breaks too! ), but without school to take the edge off, and with the excitement of impending holidays, they’re probably wired. If you’re looking for something to burn off their energy in a healthy way, and make sure their interest in martial arts lasts through the break, look no further! 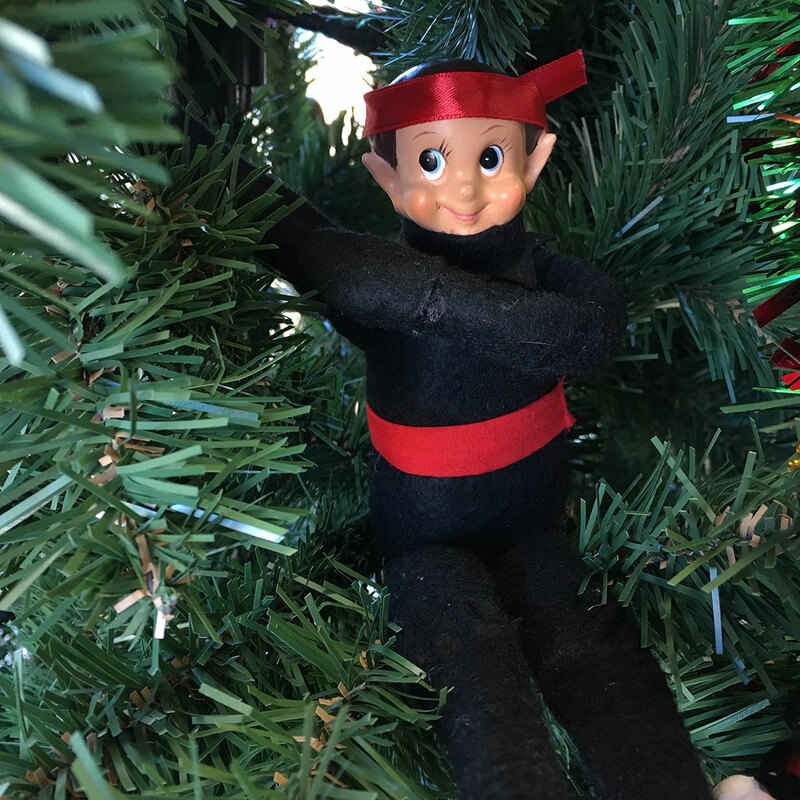 Nigel the Ninja is your perfect companion for holiday fun. What makes counting down the days until a holiday sweeter than an advent calendar? With only a little work, you can add a martial arts twist to this classic tradition. You’ll need: one or two cardboard or foam boards, tissue paper, tape, Styrofoam or plastic disposable bowls, hot glue, string, scissors, candy/small treats, markers for decorating, and paper. First, decide how many days in advance you’re going to count down. Traditional advent calendars feature the 24 days leading up until Christmas, and Christmas Day itself. You may want to do every other day, or only weekends (start in November if that’s the case). Count out that number of bowls. Cut the paper into strips (2” by 8” works great). Fold each piece of paper with a Nigel Challenge on it into fourths. Place one into each bowl you plan to use in your Countdown Board, along with a piece of candy or other small treat. Cover the top with one or two layers of tissue paper. Make sure the paper covers the entire mouth of the bowl, then tape down the edges so the paper is pulled taut, like a drum. Cut a long piece of string. Glue one end of the string to two corners of your board. Lie the foam or cardboard on the ground or a table so you’ll have a flat, even surface to work on. Arrange the bowls however you want them (ex: in a tree shape, alternating red-and-green to create a string of holiday “lights”, alternating red-and-white for a candy cane pattern – it depends how many bowls you are using). Lift up one bowl at a time, place a dab of hot glue on the bottom, and press it firmly down on the board. Continue to glue the bowls down one-by-one, preserving the pattern as you go. Once the glue has set, number the bowls. You can write to the side of the bowls, or write very, very gently across the tissue paper on each bowl. Either go in numerical order, or write the date on which each bowl will be opened. Wow, I can’t believe it’s almost Christmas! I’ve never gotten to celebrate with you and your family before, and it seems like a whole lot of fun! I can hardly wait. I bet you’re excited, too. To make the time go by faster, I’ve got an extra-special surprise for you. Every (day, other day, weekend) until Christmas, I’ve written a Nigel Challenge for you to do. You’ll have to use some of your martial arts skills to get it, but luckily, I know you’re good at punching. Break open the targets to find the challenge, and a treat, too! Make sure your child understands that they only get to punch open one target at a time. Also make sure that they know not to punch too hard (since the board is right in front of a wall – although for most young children this will not be a problem). Every time they punch open a target, they receive a Nigel Challenge as well as a treat, and get a fun reminder that Christmas keeps getting closer! For Hanukkah, you can create the same project with a simple variation. Make a board counting down the days until Hanukkah starts, or, create a Menorah board. For the latter, you will need the same materials as listed above, but only eight or nine bowls. Additionally, you will need yellow or orange spray paint. I recommend using black or grey tissue paper, too. First, spray paint the inside of all eight bowls yellow or orange (if you’re getting really fancy, you can do both, or even draw a flame design). This will represent the fire on a lit Menorah. While the bowls are drying, draw and color the shape of a Menorah and candles (or skip the candles, if you want yours to be an oil-based Menorah) on the board. The spot for the center shamash light can be an extra bowl that will be opened first, or you can simply draw an already-lit flame. Glue the string to the back of the board to allow you to hang it. I’m so excited to get to celebrate Hanukkah with you and your family! I’ve never gotten to before, and it looks like it’s going to be a whole lot of fun! In fact, I couldn’t wait to get started, so I made something for you. Use your ninja punching skills to break through and light each point on the Menorah. I’ve left a surprise for you in each one, as well as a Nigel Challenge for you to do. Again, make sure your child understands not to punch at full strength – just enough to tear through the tissue paper. Each day of Hanukkah, they can punch open a new target, going in the order of the traditional Menorah lighting. As the tissue paper is torn away, the “light” beneath will be revealed, along with a treat and challenge! Nigel’s punching board can be adapted for any holiday or special event. You could even use it as a countdown for days until a tournament. Instead of challenges, have Nigel leave short uplifting messages to ease nervousness. If the bowls don’t tear in the punching, you can even reuse them with new tissue paper. What ways have you found to use Nigel? Show us on Facebook, on the Century Martial Arts School Network page!